Australia PM Malcolm Turnbull says he will dissolve both houses of parliament and call early elections if the Senate fails to pass two labour reform bills. Mr Turnbull says the bills, which deal with the role of construction unions, are critical for the economy, but opponents say they are unfair. The bills have hit deadlock in the opposition-controlled Senate, which has rejected them several times. The PM has now asked for parliament to be recalled from recess on 19 April. If the bills still do not pass, he will initiate a rare "double dissolution", with an election slated for 2 July. He is also bringing the government's budget announcement forward to 3 May. "The time has come for the Senate to recognise its responsibilities and help advance our economic plans, rather than standing in the way," Mr Turnbull said. "This was the fifth review the bills have undergone," he said, saying "the time for playing games is over". The prime minister's audacious use of an obscure and rarely used provision in the constitution that allows the governor general to recall both houses of parliament caught his political opponents and pundits by surprise. The Senate now has three additional weeks to debate the labour bills. This is ample time to ensure that they either are passed or rejected. And there is upside for Mr Turnbull in both cases. If he convinces crossbench senators to support him, he will win a dramatic victory in the Senate, steal back political momentum and lay the ground for an election campaign later in the year. But the double dissolution scenario seems more likely and this option holds several benefits for Mr Turnbull. Although his ratings have slipped, he is still far more popular than his opposition counterpart Bill Shorten and polls have the conservative Coalition government well in front of Labor. To comply with rules on parliamentary terms, the double dissolution must happen by 11 May. Australians were due to go to the polls before the end of the year. 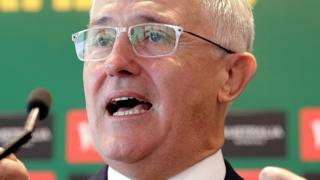 Opposition Labor leader Bill Shorten said the prime minister was in "full panic mode". "Mr Turnbull is just simply anti-union, and... we will not allow this legislation to be a camouflage from the real issues." Independent Senator Nick Xenophon, who supported the new Senate voting rules, called Mr Turnbull's decision to recall parliament and move forward the budget "a nifty and cunning manoeuvre". "Well, well, well, if you thought last week was ugly in the Senate, you ain't seen nothing yet," Mr Xenophon said. Family First senator Bob Day told Sky News that Mr Turnbull's move to recall parliament was "too clever by half". Australia's upper house (Senate) can reject legislation proposed by its lower house. A double dissolution, last used in 1987, is a mechanism designed to break deadlocks. When a bill is repeatedly blocked in the Senate the prime minister can ask for both houses to be dissolved, and an election to take place. What are the two bills being blocked? The ABCC bill seeks to re-establish the Australian Building and Construction Commission, a watchdog monitoring the actions of unions. Kevin Rudd's Labor government axed the commission in 2007. Labor and the Greens oppose its re-establishment, so the Coalition government needs support from six of eight crossbenchers for the bill to pass. In February, four crossbenchers supported the bill. The Registered Organisations bill seeks to hold unions to higher standards of transparency and accountability. Last week the government passed legislation to change the way senators are selected. The changes are complex, but essentially mean politicians from so-called micro parties - which campaign on a limited platform - will struggle to get elected. Micro party senators hold the balance of power in the upper house and have proven a headache for the Coalition. In a normal election, only half the Senate seats are contested. However, in a double dissolution election, all seats are up for grabs. That means some crossbenchers may be compelled to make sure the bill passes to avoid risking losing their seat.